Some of the very best hashish in the world is found between the mountainous border of Afghanistan & Pakistan. After many years of selectively inbreeding superior genetics from this region, we have now got a strain that is very easy to grow, even in the most unfavourable conditions. This short and sturdy plant is a good choice for both SOG and ScrOG gardens. 8 BALL KUSH™ grows wide, with thick stems and dark leaves that produce dense buds. 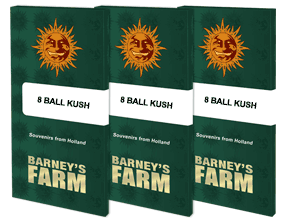 The flavours all resemble a classic Kush, earthy and musky, with deep spicy accents.